Chicago, IL (March 23, 2017) – At a press conference at 10 AM today at 30 S. Wells Street, Jewish Voice for Peace – Chicago will call on the Jewish United Fund of Metropolitan Chicago (JUF) to cut ties with anti-Muslim hate groups and announce the release of a report detailing these ties. Speakers will include Lesley Williams and Stephanie Skora of Jewish Voice for Peace-Chicago and Hatem Abudayyeh of the US Palestinian Community Network. 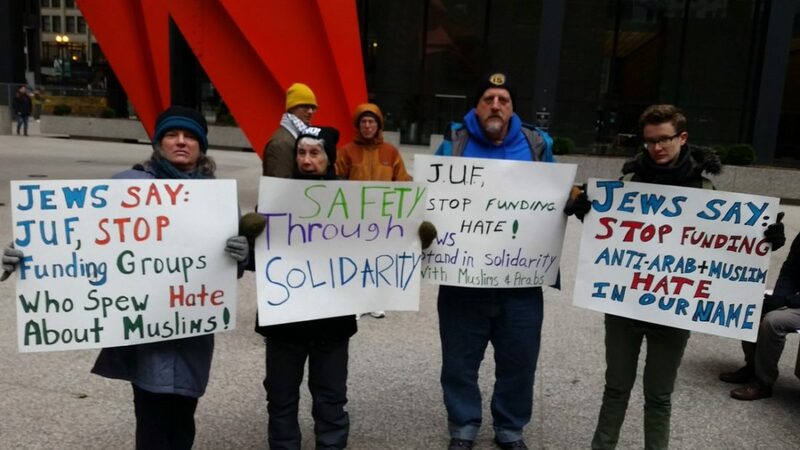 JVP-Chicago will follow up on this report by reaching out to other organizations and individuals in Chicago’s Jewish community, in particular funders, grantees and others officially affiliated with JUF in any way to urge them to pressure the JUF to stop supporting anti-Muslim and anti-Arab organizations. The report Defund Islamophobia: How the Jewish United Fund of Metropolitan Chicago Supports Anti-Muslim Hate Groups, was authored by members of Jewish Voice for Peace–Chicago in partnership with the Network Against Islamophobia, a project of the national Jewish Voice for Peace.